AMES, IOWA – Julie Perreault, watershed coordinator for the Easter Lake Watershed Project, was honored yesterday with the Circle of Excellence award from the Iowa Agriculture Water Alliance (IAWA) as part of the second annual Iowa Watershed Awards program. Perreault was honored alongside four other watershed coordinators who also received IAWA Iowa Watershed Awards for their multitude of contributions and steadfast dedication to improving water quality across the state. 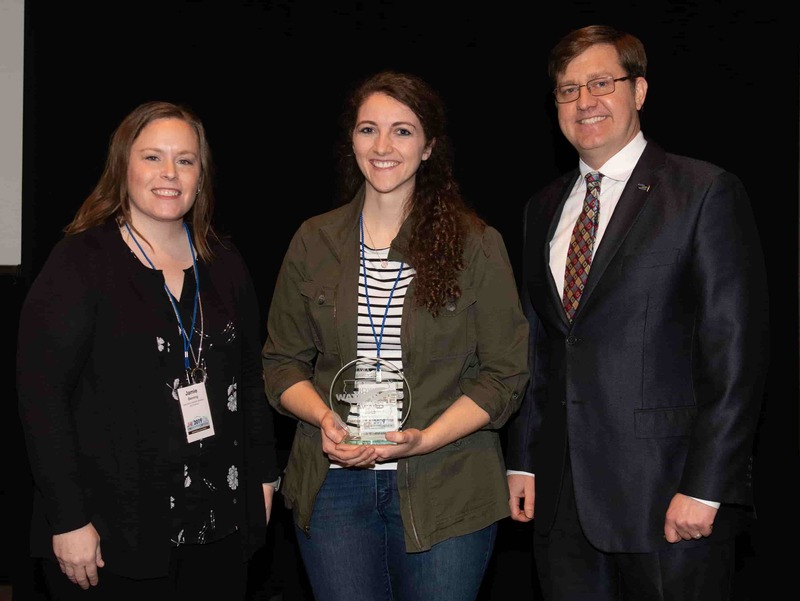 Perreault earned the award for working with a large and diverse group of urban and rural partners who are restoring Easter Lake and improving water quality in the watershed in southeast Des Moines. “Through these water quality improvements, we’re giving back a great recreational resource to a part of Des Moines that doesn’t always get the most attention,” says Perreault. She has worked with more than 25 partners, including large Des Moines employers, neighborhood associations, and outdoor recreation groups. Major partners financing the improvements include the Polk Soil and Water Conservation District, Polk County Conservation Board, the City of Des Moines, the Iowa Department of Natural Resources (DNR), Iowa Department of Agriculture and Land Stewardship (IDALS), the Natural Resources Conservation District, and the Environmental Protection Agency. These committed partners have invested $3 million in watershed improvements and $9 million in lake restoration. Conservation practices installed in the watershed include soil quality restoration by homeowners, rain barrels, rain gardens, permeable pavement, native landscaping, bio-retention cells, and a stormwater wetland. In addition, 80 acres of woodland has been restored and 4,800 feet of stream has been stabilized with another 9,000 linear feet going out to bid later this year. Multiple detention basins for drainage from 1,390 acres are also planned for restoration 2019-2020. In addition to her work with urban homeowners, Perreault has met with farmers and landowners in the watershed to facilitate installation of three bioreactors financed by the City of Des Moines. This year she is also launching an Easter Lake Stewards Group to ensure long-lasting support for these conservation practices. “We can build conservation practices in the watershed, but you will always need community involvement to maintain the practices, encourage stewardship and volunteerism, and to keep overall watershed efforts going,” she says. To help maintain momentum for this work, Perreault will receive funding through the IAWA Iowa Watershed Award to apply to the Easter Lake Watershed Project as well as funding for her own professional development. She grew up in Sioux City, where she saw the effects of water erosion on a ravine where she played as a child. That led to pursuing degrees at Iowa State University in environmental science and global resource systems. “Without clean water, you can’t do anything, whether it’s for public health or having a functioning ecosystem,” she says. “Julie’s work aligning diverse urban and rural partners in a cooperative and collaborative approach to improve Easter Lake’s water quality is a shining example of what we can accomplish when we all work together,” says McMahon.